Originally published in 1985. The French education system is unique in many ways and provides a useful contrast for those in all English-speaking countries to their own education system. The nature of the system; the resulting multiplicity of Inspectors; emphasis on nursery and primary schools and on vocational training; and the distinctions between different categories of teachers. 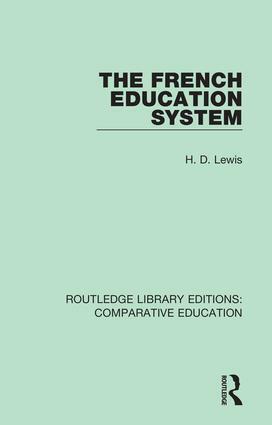 This book provides an overview of the French education system and all its components. It discusses developments since the start of the Fifth Republic in 1958 and it relates the developments to changing political forces. Reissuing works originally published between 1962 and 1995, this collection is made up of volumes that examine insights and data from the practises and situation in one country or area when considering educational practice elsewhere. Many important educational questions are examined from this international and comparative perspective in these volumes. Countries represented here include Russia, the Caribbean, Latin America, Australia and New Zealand, China, France, Japan, Israel, Italy, Germany, the United Kingdom and the United States. Many of the volumes look at the whole area of comparative education and its methods and theories, while one looks at the Unesco literacy program.